The following is a guest post from Richard Bell, a graduate student studying history at Stanford University interested in the political culture of early modern Britain and the history of imprisonment. Note: Gone Home is a game of investigation and discovery, and as such is best experienced with as little foreknowledge as possible. While I have tried to avoid spoilers here, most of the articles I have linked to contain significant plot details. If you have any interest in the game, I’d urge you to play it before reading anything about it. It’s worth it. Gone Home is my new favourite history game. It’s a compelling period piece following the experiences of Kaitlin Greenbriar, a 20-something woman returning to her family home in Oregon on June 7, 1995 after a year in Europe. Arriving to an empty house on an ominously stormy night, you are left to work out where your family has gone, picking your way through a quintessential 90s middle-class home. Indeed, The Fullbright Company has put significant effort into creating an authentic microcosm of 90s life, down to X-Files and Twin Peaks references and riot grrl mixtapes (interestingly, the only fictional pop culture references, as far as I can remember, were the video game cartridges scattered about one room). Yet it isn’t nostalgia that makes Gone Home stand out as a game about history (as an early modernist, I struggle to think of any era I lived through as history). Rather, I found myself inspired by the game’s narrative structure as a way of exploring historical method in video games. At its core, Gone Home is about investigation and discovery. It is a story told without dialogue or any direct interaction with other characters (although some diary entries are voice acted), leaving the player to piece things together by sifting through the traces left by Kaitlin’s absent family. 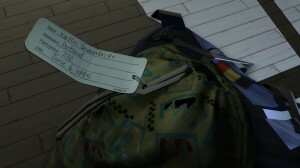 As Steve Gaynor, co-founder of The Fullbright Company, put it in a revealing interview with Jason Johnson of Kill Screen, while “novels excel at expressing the characters’ internal states”, in Gone Home the player starts “by only seeing the evidence of these people, the impression they left behind. You don’t have direct access to the internal state. You’re projecting how these people feel. There’s no way of knowing it directly.” Of course, some pieces of evidence, such as diary entries might get you closer to that “internal state” than others. Nonetheless, the true depth of Gone Home’s narrative relies on the player sifting through a familiar array source types – letters, wills, portraits, diary entries, calendars, cassette tapes, pamphlets, etc. – and collating those snippets of information in order to understand a deeper narrative. As I played, the similarities between this process and the kind of questions I ask of sources as an historian became increasingly apparent. Players are required to consume and evaluate the varying accounts and information presented to them, piece them together, and make educated inferences in order to bridge gaps in their knowledge. Questions of perspective and purpose need to be addressed: private letters between friends convey something different to a will, but only when read critically and alongside numerous other sources does a deeper narrative emerge. 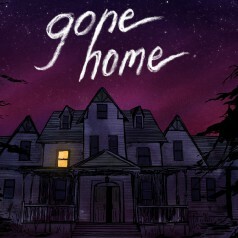 This is where Gone Home differs from something like Dear Esther. Rather than reading between the lines of a single ambiguous narrative voice, here we are encouraged to piece together a narrative encoded in numerous objects. Where Dear Esther invites the kind of textual analysis at which students of literature excel, Gone Home demands something more akin to source comparison. This process creates an almost historical account of its own: the player uncovers (even creates) a narrative in which short-term events can be placed within a series of more obscure long-term contexts. Once understood, these deeper narrative strands offer better understanding of the ways in which certain events came to pass and why they had certain repercussions. As the threads trail of further into the past, their direct relevance becomes less clear, but no less real. An otherwise simple yet utterly moving story becomes part of a wider family history stretching back through three generations, the past and present interacting. Confronted with a range of evidence, the player can piece together the lives, thoughts and relationships of a cast of absent characters, as well as understanding their (occasionally complicated) relationships with history and the past. The game never entirely spells out deeper explanations and causal connections, leaving the player to tease them out from the careful comparison of sources. There is no game mechanic for this process; certain parts of the narrative trigger as you explore, but there is no clumsy means of slotting together the pieces of the puzzle, and no real win condition. 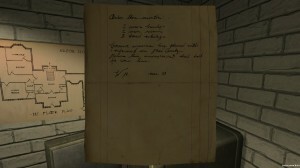 On a first pass, most players (including me) won’t put together all the clues. Indeed, some of the most (and I provide this link with a huge spoiler warning) convincing interpretations involved pieces of evidence that passed me by completely, while the comments sections of numerous blogs and gaming sites attest to the range of potential readings. While Gone Home is clearly an outlier when it comes to video game narratives, it nonetheless plays with medium’s tropes. The setting may be different, but while gaming most of us have spent time digging through draws and hacking computers for supplies and information, or reading the numerous tomes that litter virtual bookshelves. Modern game developers have devoted huge amounts of time to creating detailed histories and lore for their worlds, expressed through peripheral information available to more intrepid players. Accordingly, there are deep readings to be made of AAA games like Fallout and Bioshock (tellingly, The Fullbright Company has a strong heritage in the Bioshock series). 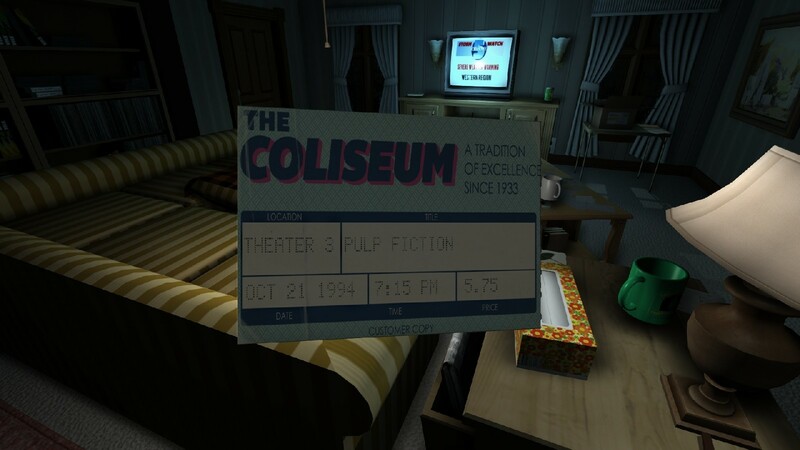 Yet in Gone Home, this process is not simply about set dressing or creating a more immersive experience. Instead, it’s the entire experience. This knot of narratives is held together, and made compelling as a gaming experience, by a set of engaging (yet absent) characters and the eerie tension of an abandoned yet familiar house. It’s a game that plays on the emotions: an emotive hook drives the process of source analysis, as each new item brings with it compounding revelations. Yet conversely, the story gains this emotional momentum precisely from its peculiar narrative structure, affording the whole thing a kind of voyeuristic intimacy that invests the player in these stories – something that would be hard to achieve were the characters present. At times, it becomes so intimate, as Naomi Clark points out, that the game even recoils from it. If nothing else, I found it a sobering reminder of just how personal the kinds of sources we use to write history can be. Naturally, there’s a degree of artifice to all of this. Most objects convey conspicuously deliberate and particular meaning, and at times one might question why a letter from the 1970s has been left lying about. I also wonder just how far interpretations of the narrative can stretch; while we are offered the perspectives of a range of characters, each seems designed to give a sense of a single coherent plot. Of course, this makes perfect sense, given that the creators’ primary aim is to tell a story. Yet I wonder how far the concept could be taken if multiple competing narratives were introduced, leaving the player to weigh up the evidence a little more. Few games ask their players to engage in the kind of critical inquiry that Gone Home encourages, yet The Fullbright Company’s deceptively simple innovation is still full of untapped potential. What really struck me when playing Gone Home – and I’m sure I’m late to the party on this one – is how wrongheaded I’ve been in my approach to the relationship between history and videogames. Previously, I was concerned with how the stories of the past could be told in an interactive manner. But now that I’ve spent some time at the Greenbriars’ home, Trevor Owens’ call to “let go of narrative and start by asking themselves different kinds of questions” strikes me as all the more apt. Video games that model the kinds of experiences and choices that make up historical contingency, such as the recent Papers, Please, have the potential to convey an understanding of the past that goes beyond narrative. Yet what if, as well as games that model the experiences of historical actors, we explore those that convey the practice of history? This comes back to another point Trevor Owens made here a while back: games can “provide captivating space to develop the kinds of critical tools for thought that historians develop”. Yet Gone Home challenges Owens’ conclusion that we can’t simply say “hey, lets put a bunch of text documents in something and call it a game.” Because that’s precisely what The Fullbright Company have done, albeit in an inventive and engaging manner. While it’s certainly a niche game, and one that is fuelling the often vitriolic debate of what a game even is, it has been received with widespread critical acclaim and a devoted fan base. There’s an audience for this kind of experience. As I’ve mentioned, Gone Home is remarkable because its condensed document-centric gameplay is precisely what creates the kind of engagement that other games have to foster through multiple hours of exhilarating gun battles or stealthy tension. Not only that, but it does this on an emotional register that we rarely experience in video games. Perhaps, in the debate over the role of games in museum collections and historical teaching, The Fullbright Company have given us even more reason to be as bold Rebecca Mir would like us to be. While Kevin Bacon’s Murder in the Mansion may not look much like Dear Esther in its final iteration, it shares a lot in common with Gone Home. With Gone Home as a working example, could we imagine more games that encourage this kind of historical analysis built around selections from actual collections or archives? Or ones that, even if fictional, make explicit the promotion of kinds of critical skills that we teach as historians? These expertise are undoubtedly the most important thing we have to offer our students, and Gone Home has made me excited about the different ways we might convey them. Excellent post, Richard. I wholly agree with your point that there is a striking similarity between the pleasures of search and discovery in a game, and the appeal of historical research. I don’t see these elements as rivalling the more familiar rule and challenge based mechanics of games, but considered in their own right they do point towards an alternate track for exploration and development. I haven’t yet played Gone Home, but I can see the similarities with our (much cruder) Murder in the Manor. The fragmented story scattered as found evidence throughout a play space is a common narrative device in video games; when sketching out the idea for Little Green Pig, the writing group, I plundered it almost without thinking. System Shock 2 has always stuck in my mind as one of the earliest and best implementations of this approach, and that’s part of Gone Home’s ancestry. Have you played Christine Love’s Analogue: A Hate Story or Hate Plus? Much of both games involves reading and comparing source documents from the fictitious history of a Korean colony ship that failed to reach its destination, with commentary provided by the ship’s AI. While your goal in the first game is mainly to puzzle out the root password to the ship’s computer so you can retrieve its contents or learn more about the AI on board it, in the second game (a sequel) your goal is explicitly to investigate what happened prior to a revolution that wiped most of the ship’s memory and reset its clocks. 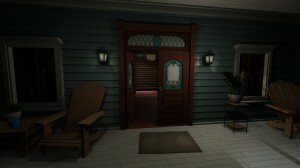 And the game relies heavily on historical thinking; you have to weigh competing sources and their perspectives, you have to consider the differing interests of your AI companion who is providing commentary, and, like in Gone Home, it is ultimately up to the player to piece everything together into a narrative.